04:55:00 20 servings, 1 piece (110 g) each. 20 servings, 1 piece (110 g) each. 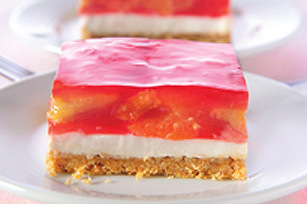 This fruity, no-bake layered dessert is great for family get-togethers. Fresh strawberries and JELL-O pair up in this cool and creamy dessert. Mix graham crumbs and margarine; press onto bottom of 13x9-inch pan. Mix cream cheese spread and milk in medium bowl until blended; Stir in Cool Whip. Spread over crust. Refrigerate until ready to use. Add boiling water to jelly powders in large bowl; stir 3 min. until completely dissolved. Stir in cold water. Refrigerate 1-1/2 hours or until thickened. Stir in strawberries. Spoon over cream cheese layer. Refrigerate 3 hours or until firm. Substitute 1 pkg. (600 g) frozen whole strawberries, sliced, for the sliced fresh strawberries. Stir into jelly along with the cold water. Refrigerate 10 to 15 min. or until thickened; spoon over cream cheese layer. Continue as directed. Serving Size 20 servings, 1 piece (110 g) each.